Wow, this Taiwan trip was some time slip! A very busy week of business in Taipei, Hsinchu, Taichung, and a couple of universities. It went by fast. No time for blogging until now as I procrastinate on packing and going to bed before heading home in a few hours. Another 24 hour trip which takes place in the same calendar day but doesn't quite buy back the time I lost at the International Date Line last weekend. A la recherche du temps perdu. Oh well. I did take a look at Orbit Hangar for the latest Orbiter add-ons and found an excellent new high-res texture for Jupiter (level 8, 13 MB zip file) by "Schimz," based on Cassini imagery. I really like the the detail and the blue regions. 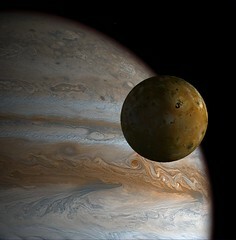 The picture shows Io in the foreground. Looks like a JPL image, but it's a screen shot from Orbiter. In Kim Stanley Robinson's Red Mars, there is the idea of the Martian time slip, a 39.5 minute period between midnight and 12:01 that "stops the clock" each night to allow practical use of an Earth-like 24 hour clock despite Mars' slightly longer rotational period. After a 32-hour door-to-door journey from Boston to Taipei (including ground transport and layovers in San Francisco and Nagoya), I feel like I have experienced such a time gap. On the 11+ hour flight leg from SFO to NGO, I slept for several long blocks, waking up for short periods to check the flight map and read for a while, never quite sure what time it was, since there were four time zones in play (EST, PST, Japan, and Taiwan). Usually I try to follow a jet lag regimen in which I mentally switch to destination time, and sleep or rest only when it's night time at my destination. But this time I just let the time flow and slept when I was tired. I still slept a full melatonin-assisted first night in Taiwan, so I guess it's working out. I'll know by tonight I suppose. One thing I miss on these long Pacific flights is Orbiter's time acceleration feature. Press the T key and speed up the clock by ten times. Doesn't work in the real world, alas, so I wonder if I'm really cut out for a Mars journey. Not that this is an imminent possibility, probably not at all unless the life extension thing kicks in pretty hard and soon. Andy McSorley has been working on the Earth-Mars chapter for the new edition of Go Play In Space (he thought he was done until I suggested looking into some promising future launch window dates in 2014 and 2033 - sorry Andy!). Depending on the dates and the delta-V you're willing to spend, a Mars flight can take from three to seven months. I hope I can get a business class upgrade for that flight! The picture is only vaguely related, a new Orbiter add-on called Mars Hourglass Crater Base by "peaceman." This is a futuristic Mars base with some great 3D terrain based on NASA MOLA and ESA Mars Express data. The hills look especially realistic. I downloaded but no time to try it so far (real work to do here in Taiwan). Mars is getting to be a cool destination - in Orbiter at least! Yesterday I was in the waiting room of dentist’s office, waiting for my daughter. A young man was standing in the office area nearby, having a discussion with the receptionist regarding the origin and age of the universe (which I couldn’t help but overhear). I later learned that the young man was the dentist’s son, a college student home on spring break, and a math-physics major. The woman was pretty clearly a Christian who believes in the literal truth of the Bible as far as the creation and age of the Earth and the universe. This was none of my business, of course, and I didn’t say anything, though I really wanted to tell the physics student to save his breath, as it was clearly a physics vs. faith discussion, and faith wasn’t going to budge. They would have to agree to disagree at best. But it made me wonder about a couple of things, and especially why these sorts of discussions seem to always focus on the origin and age of the universe and on the origin of humans. Of course this is because these are pretty much the fundamental questions, but since no one was around to directly observe the key events, and because the scientific view is based on a chain of observation-based reasoning, these basic questions are difficult or impossible to resolve in such discussions or debates. The basic assumptions are just too different. You could even argue that the scientific view itself contains elements of faith – faith in the importance and validity of the scientific method, belief that observations that can be independently corroborated by different observers are better than results obtained by assertion and literary analysis, and so forth. I suppose it is also faith to believe that physical phenomena must have physical explanations, and that physics is a better description of what we see around us than magic. I see these more as “working assumptions” than as elements of faith, and these working assumptions have served us well in terms of understanding (science) and controlling (technology) many aspects of nature. But faith also has its fans. So what to do? Give up? That would probably have been the best thing in this case. But in general, I would like to see such a discussion steered to a more immediate level. True, no one was around to see the Big Bang, and we infer that it happened through a lot of rather technical steps. Many people have reproduced these steps, and scientifically educated people agree that they make sense, but it is still an indirect argument. The same with evolution – true, “we have the fossils,” but Biblical “young Earth” advocates and creationists have alternate explanations (e.g., Matt Bors’ revised science textbooks for Christians), however far-fetched these may seem to the scientifically minded. Again it is difficult to reach common ground when the basic assumptions are just so different. I would ask instead, do you believe your TV works? The satellite TV receiver on your roof? Your cell phone? The cells in your body? Do you believe that airplanes fly? Do you believe that bacteria become resistant to antibiotics? Physics and the sciences that derive from physics – chemistry, biology, and all the rest – can explain these things, and you can observe the results. Engineering, biotechnology, medicine, agriculture, and much more, all depend on the results of science, and on the scientific method, and we rely on these technologies for our very survival in the modern world. You could go into detailed explanations of these things, but I won’t do that here. The point is that science works, and that we accept and rely upon many things that result from our understanding and application of science. If you want to believe that science only works here on Earth (and not in distant stars and galaxies), and only now (not thousands or millions or billions of years ago), then you can believe that God is pulling the wool over our eyes to make it look like galaxies are billions of light years away and moving as if expanding from the Big Bang, and to appear that fossils are tens of thousands or millions of years old. I can’t see why he would bother to fool us in this way, but if you want to believe that, OK. The good news is that you don’t have to believe in or understand science to enjoy its benefits. The bad news is that people who don’t understand and accept science are more likely to have children who don’t understand and accept science. That’s OK too as long as you don’t mind the likelihood that most of our future scientists and engineers will be in China, India, Korea, and other Asian countries. And America will have a lot of faith. What's the ISP of PDF? Unfortunately, PDF isn't actually a propellent, it's a publication format. Too bad, because there is a lot of it floating around the web. This bizarre thought was triggered by yet another "humans to Mars" study that I hadn't seen before, this one by the European Space Agency (thanks for the link, Andy). It's quite an interesting study. Here's a link to it, and a few more you might find interesting. Of course a Google search will turn up even more, and if you want to keep your search within NASA sites, you can always add the qualifier site:nasa.gov to your Google search string. All links below are PDF files. MarsDrive Reference Mission, "Mars for Less"
When I noticed I had used the phrase "space is big" in my last post, I decided to link that phrase to the famous Douglas Adams quote about how big space really is. So I did. But then I had a look at the other 22 Douglas Adams quotes on that same site, and they are really, really funny. So I decided to point this out. And now I have. I'm sure there are dozens of others on other quotation sites, not to mention his books. Adams was quite the amusing guy. I'm working on an expanded second edition of my free tutorial book for Orbiter, Go Play In Space. This time I've signed up Andy McSorley as a co-author, and he has written a nice new chapter to guide our readers through a journey to Mars (with the help of Jarmo Nikkanen's Interplanetary MFD add-on). Meanwhile I'm working on another new chapter called "Dancing in the Dark" - a chapter title borrowed from Wayne Lee's book To Rise From Earth. The subject is rendezvous (which is called orbit synchronization in the Orbiter documention) and docking, one of the most satisfying tasks you can do in Orbiter. It can also be one of the most frustrating tasks for new users to learn, so I'm trying to do a good job of explaining how it works in this new chapter, including several diagrams inspired by Wayne Lee's book. Like much of space flight, rendezvous and docking is largely a matter of timing, of literally being in the right place at the right time. Space is big and finding your way to the relatively tiny International Space Station in all that darkness can be tricky, even though Orbiter provides several excellent tools to guide your way there. Two important tips are precision and patience. Small residuals can add up to big miss errors over several orbits, and trying to rush your approach often leaves you hopelessly misaligned. Unlike the real shuttle astronauts who will spend several days and dozens of orbits to reach the ISS with minimal fuel use, Orbiter's futuristic "Delta Glider" lets you make relatively large and frequent "burns" as needed, and time acceleration lets you speed over the "boring" parts at 10-1000 times real time. More pix on Flickr. 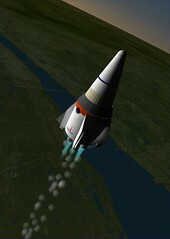 The Space Foundation produced The Case for Space Exploration because it strongly believes that a robust program of space exploration has been and will continue to be vital in sustaining the United States’ economic and national security, driving innovation, and motivating pursuit of and excellence in science, technology, engineering, and math (STEM). I certainly agree with that statement! 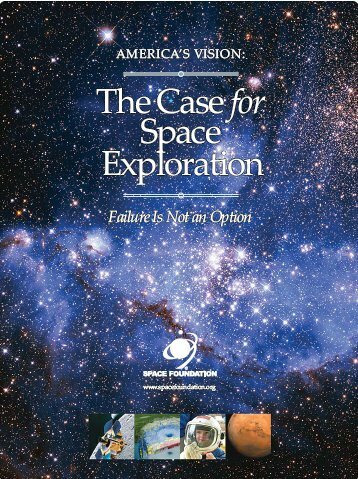 I'm looking forward to reading this document and to exploring other educational resources on the Space Foundation's web site. I'm in Pasadena, California on a business trip, including a two day class at the Caltech Industrial Relations Center on doing business with India, an important subject for my international distribution manager responsibilities. Caltech has a great campus, and I really enjoy the fact that when eating lunch at the Athenaeum (Caltech Faculty Club), that I am dining in a room where Millikan, Michelson, and Einstein, and of course Richard Feynman, had also dined. Caltech also operates nearby JPL for NASA, so space geek that I am, I wandered over to the Caltech bookstore in hopes of finding... some sort of space geek stuff, I guess. Lots of books, nothing really special that I don't already have (yikes). So I check out the apparel. Caltech T's and sweats... nah. NASA T's and sweats with a giant NASA logo on the back... nah. JPL T's and sweats, not really rocking my world. Then I saw it - in the total geek section of shirts with Maxwell's equations and DNA diagrams - a Caltech t-shirt that says "Actually, I am a rocket scientist." I was walking to the cash register when I realized the scorn I would have to endure from my daughter if I ever actually wore this shirt. I put it back. Now it can be told: I'm a wimp and a geek. P.S. As I was grabbing JPL's web link, I noticed a new item (March 13) there, a still frame from a simulated fly through video of Valles Marineris, assembled from hundreds of images from NASA's Mars Odyssey orbiter. It's really amazing! 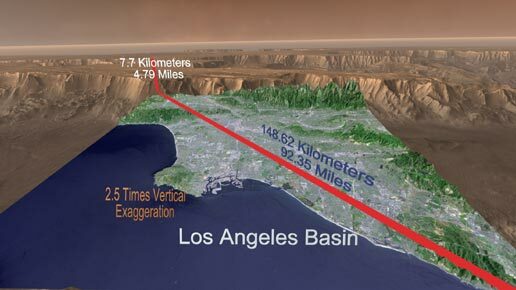 The picture above is a frame from the video that shows the Los Angeles Basin area inserted into Valles Marineris with room to spare. Mark Paton has released his "final" version of the DH-1 add-on for Orbiter, having added a virtual cockpit (using Vinka's latest spacecraft3.dll), more scenarios, more documentation (a nice PDF with operational details by Mark and a bit of background contributed by me), and more. It's really cool and it makes me wonder: why isn't someone doing something like this in real life? The landed pix with the astronaut give a good idea of the scale. 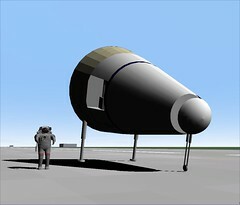 This is not a tiny vehicle, and both stages are piloted and fully reusable. In my opinion, this summarizes the basic problem with any religion that claims to have an exclusive line on what constitutes "God's will" or even what is supposed to be fundamentally right. You don't need any god's permission or approval or some promise of salvation to be good. You can perform a good deed, help your neighbor or a stranger, and live a moral life in general simply because it is the right thing to do. It's not rocket science. By the way, the "defenders of the faith" to whom Zizek refers are atheists. The Mars Reconnaissance Orbiter (MRO) spacecraft is in its final approach to Mars today, and late this afternoon (4:24 pm Eastern time), it will perform an orbital insertion burn to enter an initial high-ecentricity orbit. Over the next 6-7 months, a series of some 500 aerobraking maneuvers will use drag from Mars' thin atmosphere to circularize the orbit to its operational state. You can learn more about MRO and its arrival and follow the JPL mission timeline here. Thanks to Orbiter add-on developer Brian Jones and Orbiter Forum member "Peter3210," you can simulate the arrival of MRO yourself. 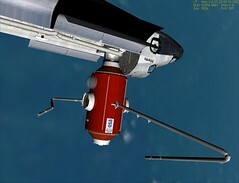 Brian's MRO add-on is available at avsim.com (search for mro.zip), and Peter has posted a set of instructions and a starting scenario for simulating the mission from 7 am EST to the insertion burn. I heard a pretty good report about MRO on NPR this morning (a rare and wondrous thing to hear a space story on the radio, though more likely on NPR than anywhere else). MRO has some amazing instruments on board, and if all goes well, it could return 10 times as much information about Mars over the next few years than all past Mars missions combined. P.S. at 5:46 pm EST - I parked NASA TV on my tool bar for the last 90 minutes so I could half-watch the JPL control room as the spacecraft's signal was lost and reacquired, both right on time. 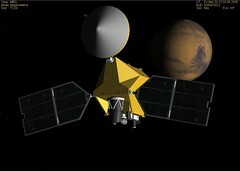 Early telemetry shows that MRO is in its initial Mars orbit and is healthy. Very cool! 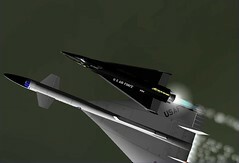 Aviation Week has an article about a supposed secret military "space plane" called Blackstar that may or may not be related to the supposed hypersonic Aurora reconaissance aircraft, and may or may not have been a manned military orbital test (or operational) vehicle in the 1980's and 1990's. It might have been launched from a supersonic carrier plane resembling the experimental Mach 3 XB-70 bomber of the 1960's. And as a colleague said, the author of this piece may or may not be vacationing in Guantanomo Bay and unreachable for comment. It might also have something to do with pulsed propulsion systems and strange strings of high-altitude clouds as discussed here. Or not. I don't know. But I do know that the non-classified Orbiter add-on developer team of Greg Burch and Scott Conklin have developed something really cool that has nothing to do with this but looks an awful lot like the AWST artist conceptions (except it rides on top instead of underneath). Their "alternate history" X-15 Delta (developed from their earlier realistic X-15) is a very cool add-on for Orbiter, and it includes not only three versions of the delta-winged X-15 variant, but a new launch aircraft: the XB-70! I have only played briefly with this add-on, but it is another work of art in 3D and flight modeling as well as documentation. Download, install, fly, and take as many pictures as you want. Wow, that was close. 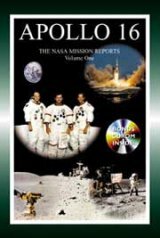 I still have just the two books shown, and I can now easily read hundreds of pages of mission debrief interviews with John Young, from his Moon landing flight on Apollo 16 in April 1972, and his flight as commander of the first orbital mission of the space shuttle Columbia (STS-1) in April 1981 (they were the only two books in the series on the sale table, so the double dose of John Young was just by chance, and the Space Shuttle book actually covers the first five missions plus landing tests with the non-orbiting Enterprise, though STS-1 gets the most coverage). There are also mission timelines, press kits, photographs, diagrams, etc. There's a CD included with each book, with hundreds of pictures and movies. Really really cool stuff. Space geek heaven. John Young had an amazing space career, by the way. 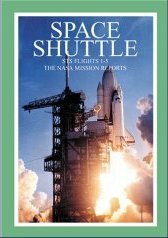 He flew in all the NASA manned space programs except Mercury and Skylab - Gemini 3 (the first manned Gemini), Gemini 10, Apollo 10, Apollo 16 (that's right, two Moon missions, one orbital, one landing), as well as shuttle missions STS-1 and STS-9. What a job! Now I have to find the Descartes lunar scenery so I can fly Apollo 16 in Orbiter one of these days. Vinka's web site is deceptively simple, just a single page with a few download links. But it's arguably the engine that drives most of the large fleet of virtual spacecraft add-ons that are available for Orbiter. Vinka is the author of the spacecraft.dll and multistage.dll series of code modules for non-programming add-on builders. 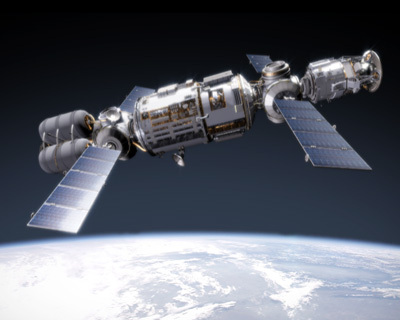 Using them, you can create spacecraft models that access many of the vehicle programming "hooks" that Martin Schweiger has made available in the Orbiter SDK (software developer kit). This is done by defining parameters in .ini files using a text editor - not always simple to get right, but no programming required. Vinka's DLL's have long supported the basic behavior of spacecraft and aircraft, engines and thrusters (complete with customizable particle streams), and even animation of vehicle features such as landing gear and control surfaces. The latest version (spacecraft3.dll, compatible with spacecraft2.dll) has just been released, and it adds some really cool new features, including expanded aerodynamic parameters (with basic models based on the Delta Glider, Space Shuttle, and a "capsule" vehicle). 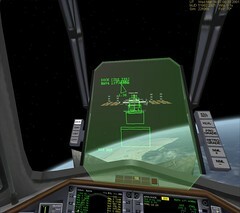 It also extends animation to allow modeling of spacecraft with a user-controllable robot arm, as well as providing support for a basic virtual cockpit with slots for working MFD's and HUD! The add-on builder is still required to create the 3D meshes and textures for everything and to define the needed parameters in the .ini files to tell the DLL what to do where and when. This remains an art in itself, but at least it removes the added requirement to be a C++ programmer. Amazing things can be built with this approach (e.g., X-15, DH-1, many more), and some have already been released that make use of the latest features such as the unusual OCTOPUS space station module by Papyref - it supports two robot arms! In short: in the Orbiter add-on world, Vinka rules. I have loved the newspaper and web column The Straight Dope for many years. Cecil Adams (and his dedicated staff) tell it like it is on almost any sort of question, often with just the right sarcastic tone when questioners ask for it (I think some people write in hopes of being insulted by Cecil - or maybe they really are that dumb). Today's Straight Dope email revisits a physics problem that circulates on the web as a trick question. It's the case of an airplane taking off on a conveyer belt runway. Very nice discussion of this here, now including the case of the continuously accelerating conveyer belt runway (very few of these in use up to now). As usual, Newton wins, with an assist from Cecil Adams. Over at MarsDrive Consortium is a fascinating document entitled MarsDrive Reference Mission: "Mars for Less" (1.9 MB PDF). It is a nicely explained and illustrated description of how a Mars Direct type manned Mars mission could be accomplished through the use of multiple launches with medium lift launch vehicles sooner and more cost-effectively than with heavy-lift launch vehicles. While HLLV's are certainly desirable, their development time and costs are very high, meaning that they will probably not be available for many years, assuming their development survives the budget hurdles of multiple administrations and crises. There certainly are also challenges in assembling large Mars-bound systems in Earth orbit, but this paper explains that these are not insurmountable, and in some respects, on-orbit assembly represents the most well-tested aspect of manned Mars missions. And there are already MLLV's that can do the job, with more in development, so development delays and other problems with one launch vehicle do not necessarily lie in the critical path of the entire mission. This paper was written by Grant Bonin based in part on earlier articles he published in the Journal of the British Interplanetary Society, Vol. 58, 2005, and The Space Review, January 2006.